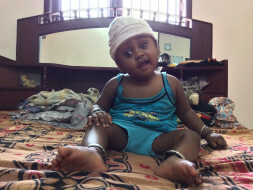 At only 11 months, Baby Nidarshan fell down and had a grave head injury. His parents admitted him in a hospital and got the operation that the doctors asked for. Now he needs another surgery to replace his skull and drain more fluid from his head. His father, a ticket booker in a small travel agency needs help saving his son. Nidarshan had just started calling his parents amma (mother)and appa (father) when his life took an unpleasant turn. He was learning to stand up and walk. An adventurous child, he tried to walk upright on stairs that proved too much for him. He fell on his head and his delicate, soft infant skull cracked at the impact. He started crying and fainted. His parents rushed him to the hospital. The doctors said his head was swollen because of internal bleeding. Immediate surgery was performed to ease the pressure. The doctors removed a part of his skull and bandaged his head. For the last six months, the dressing on his head is changed twice a month, but the swelling has come back. “The doctors have said that Nidarshan needs urgent surgery because of the pressure. Even the smallest impact will directly hit his brain hard,” he says. The swelling is beginning to affect his growing face and even his eyes. If untreated, the brain damage will be too severe to reverse. Taking his baby to the hospital was the most scared Vijaykumar has been. 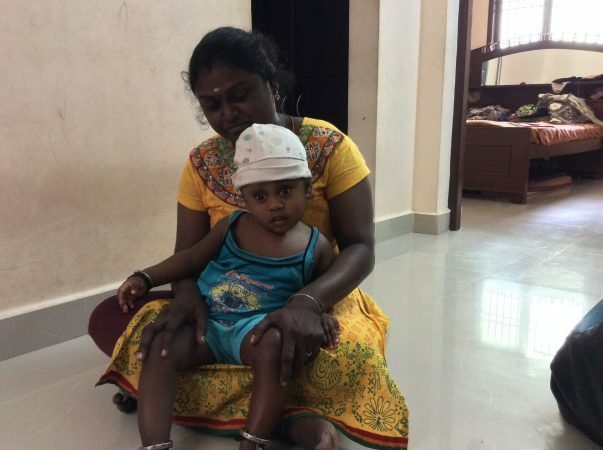 Revathi fainted when she heard that this one fall could injure her baby's brain permanently. 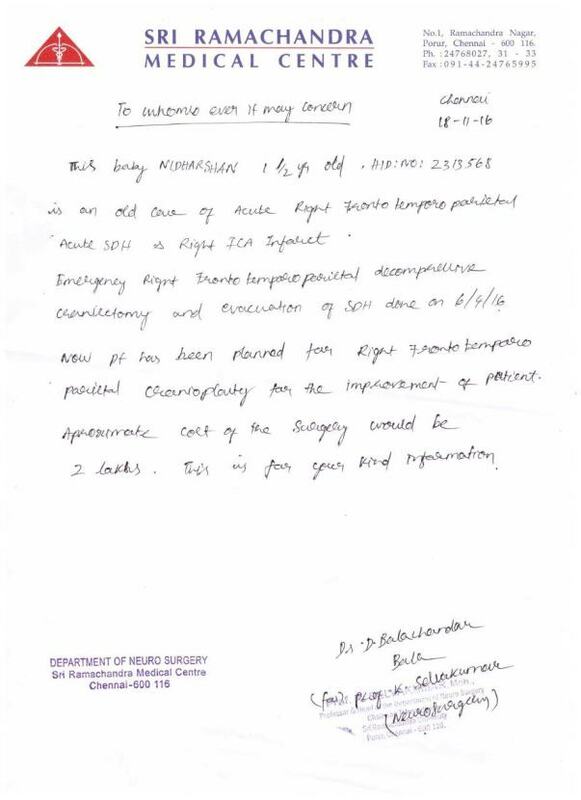 Vijaykumar asked for help from every one and raised the Rs 5.5 lakhs needed for Nidarshan's surgery in over three weeks. With a monthly income of Rs 8,000, there were times that Vijaykumar doubted that he could raise the amount in time. After borrowing from every one, he had no recourse but to borrow from the local moneylender at 2 and 3 percent. Now saddled with debt, he is unable to raise any more money. The prospect of not having money to treat their baby is breaking Vijaykumar and Revathi's hearts. 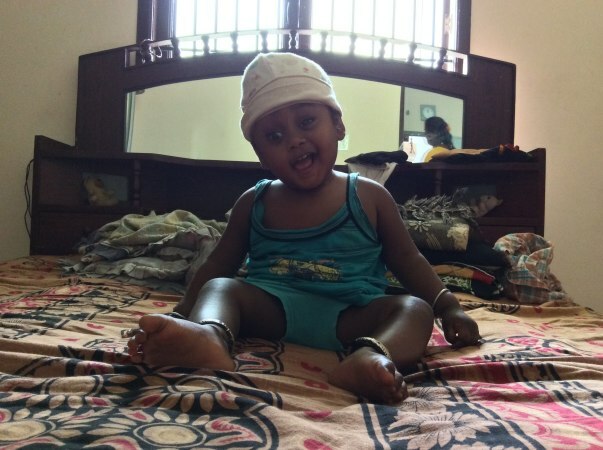 In their time of despair, they need help raising funds togive Nidarshan the operation he needs to grow into a healthy child. Donate now. Apologies for the delayed update on Nidarshan's health. Currently, Nidarshan is at home and doing fine. There are good signs of improvement after his last surgery which happened last year. He is on regular medication as prescribed by the doctor and has to visit the hospital for monthly follow-up. Doctors are of the opinion that the second surgery will happen in next 2-3 months. I would like to thank each and every one of you for your contribution towards my son's treatment. We have not gone ahead with the surgery yet as the fundraiser has not reached the estimated surgery amount. We are trying multiple resources to raise funds but in vain. I request you all to share the campaign among your network. We cannot delay further as it is very risky for the Nidarshan's health. Fluids are getting settled in his skull, hence he is unable to walk. He only plays and sits. He is idle and unable to think like a 2-years old because of the fluid accumulation. He is getting physiotherapy from Dr. Maheshwari. Because left leg and left hand are not working - right side of the brain is affected. Slowly his hand and leg are regaining senses. Kindly help us reach the target amount and help our baby.